Joan II in the background on the breakwater of the Houston Yacht Club. A testimony to mooring skills but to no avail. Why did we accept "total loss" settlement from our insurers ORM? 1. Adding all the damage repair together, including some not yet completely surveyed damage and items that undoubtedly would have emerged, the total came very close to the insured value. This was still true even going for less complete repairs and didn't consider the list of pending improvements to have a sea-worthy yacht. 2. 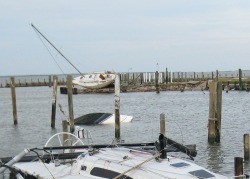 The salvage operation from the isolated position on the breakwater was taking a long time to organize, and is still somewhat unclear; complicating the starting of repairs and exposing us to problems with the yacht harbor management. 3. If we would have been the only yacht with damage, repairing would have been easier. After the hurricane there are thousands of damaged yachts around Houston and it is becoming more of a challenge or even impossible to even find a place to park the boat while waiting for a yard. 4. Waiting time for repairs are more than half a year; this would mean that we would, at best, be ready just before the next hurricane season. 5. With so much work repair yards can be and are picky and demand a premium price. 6. Experience with the last days trying to organize things, and the frustration getting simple repairs done in this area even before the hurricane , shows that the project management would have become a challenge, tiring and very time consuming.